Google, the company, entered this world in 1998. I’m not sure how long it took for Google, the verb, to follow?? ?but I do know that millions of people engage in that particular activity many, many times each day. For half of all Internet users worldwide, Google is the portal to the collected and digitized wisdom (and folly) of humanity. Google’s search engine has changed how we conduct research, plan vacations, resolve arguments, find old acquaintances, and check out potential mates. It’s also given us new ways to interact with maps, mail, books, news, and documents, radically reshaping the way we think about almost every imaginable medium. 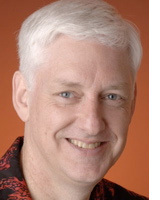 Peter Norvig, the director of research at Google, has been involved in this project since its toddlerhood. Norvig joined the company in 2001 and, from 2002 to 2005, served as its director of search quality?? ?a position that put him charge of the company’s core Web search algorithms. Below, he and I talk about (among other things) how engineers think about error, what’s good about failing fast, and why Google buys cheap computers. Good interview with Google’s Research Director – intriguing how the big minds at the G think and operate. I wonder what his take is on Google Wave?